Alfa Laval Packinox design is the largest type of plate heat exchanger currently available anywhere in the world. The heat recovery duties for which Alfa Laval Packinox heat exchangers are used normally involve very long temperature programs – normally at several hundred degrees Centigrade – with only a small temperature difference between the flow fluids. Highly efficient heat exchangers with very large heat transfer areas are needed to handle such duties. Alfa Laval Packinox design consists of large explosion-formed metal plates, welded into a plate pack that is then inserted into an even larger pressure vessel. 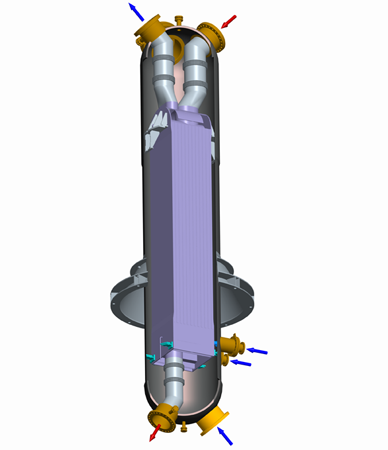 This unique configuration combines the exceptional thermal and hydraulic efficiency of modern plate heat exchanger technology with the traditional advantages of shell-and-tube units under high temperatures and high pressures. The result is extremely efficient heat recovery within a compact structure that can deal with very large throughputs. Such compactness also means major savings in infrastructure and installation costs, while the improved heat recovery efficiency results in greatly reduced energy and emission costs. Prime uses for Alfa Laval Packinox heat exchangers include the recovery of heat from feed/effluent flows in processes such as catalytic reforming, diesel or naphtha hydrotreating and paraxylene or toluene production. The popularity of this design in refineries and petrochemical plants reflects companies' need to optimize key processes when operating in markets characterized by growing demand and high energy prices, as well as a focus on energy recovery and reduced emissions. Alfa Laval Packinox combined feed/effluent plate heat exchangers comprise a welded bundle block and a pressure vessel. Heat transfer takes place solely within the bundle block, which means there are no process fluids circulating inside the shell itself. The pressure vessel is filled with a higher-pressure fluid that holds the bundle block under compression. of safety for both plant personnel and the environment, even in high-pressure applications. only a minimal chance of leaks occuring, and the risk of fire or harmful emissions to the atmosphere is virtually non-existent.